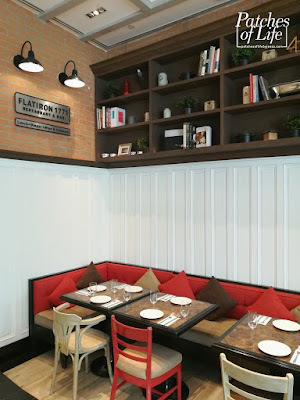 Home / BGC / FlatIron 1771 / Food / Main / Taguig City / Uptown BGC / FlatIron 1771: Prime Rib Steak, Seafood Jambalaya, and more! 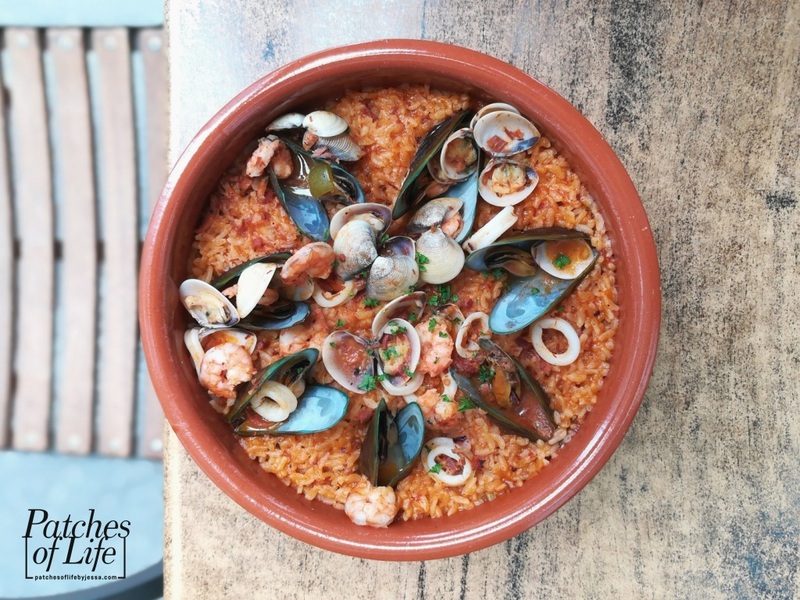 FlatIron 1771: Prime Rib Steak, Seafood Jambalaya, and more! 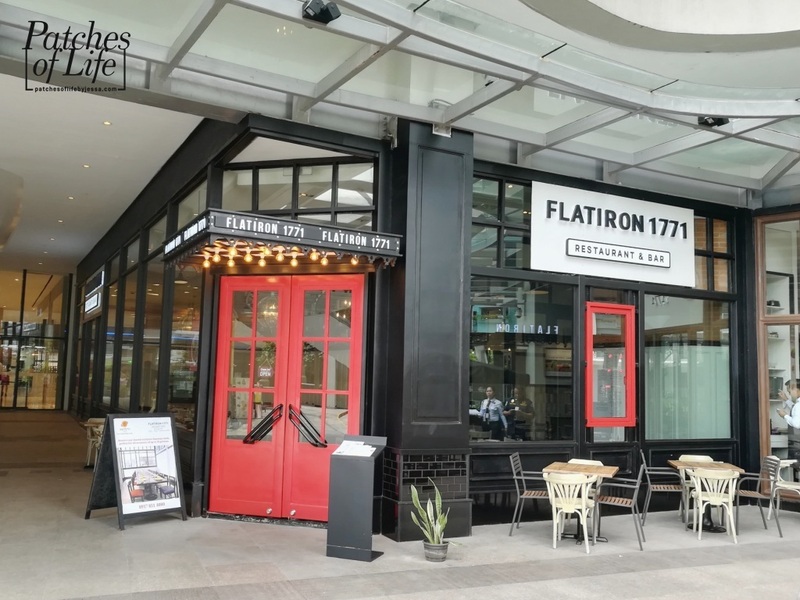 I was there when FlatIron 1771 first opened in Uptown Mall, Bonifacio Global City in 2016 (see post here: http://www.patchesoflifebyjessa.com/2016/08/flatiron1771-steak-brisket6-more.html). I loved the modern sleek ambiance of the store back then in solid colors of black, red, and white. 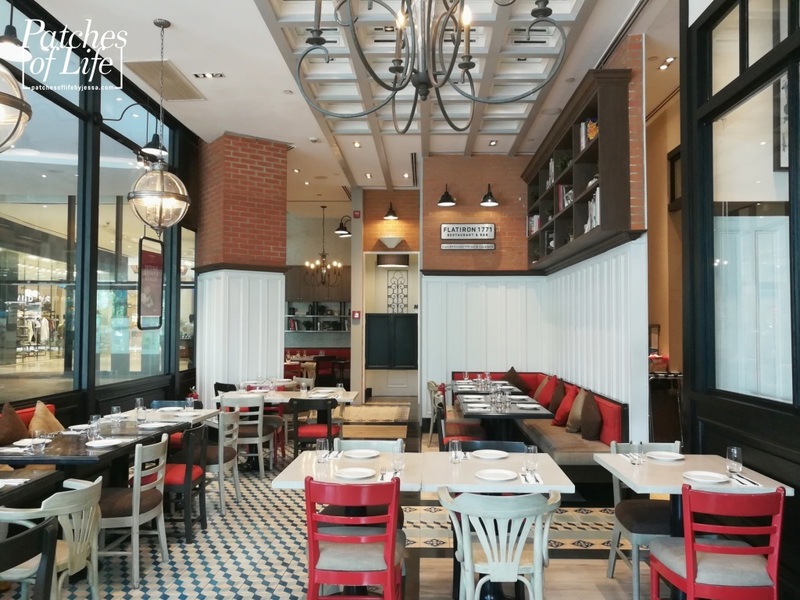 They aren't cheap but reasonably priced for the quality of food and service they provide. Though if you are going solo, you might find yourself spending extra as most of their dishes were for sharing. Last year, 2017, FlatIron 1771 decided to rebrand to a livelier and more colorful vibe (see post here: http://www.patchesoflifebyjessa.com/2018/05/flatiron-1771-new-look-new-menu.html) which I actually liked. It's a plus that they offered solo-size dishes perfect for lone or couple goers. And now 2018, FlatIron 1771 found their true identity which is inline with the prestigious 1771 Group of Restaurants. 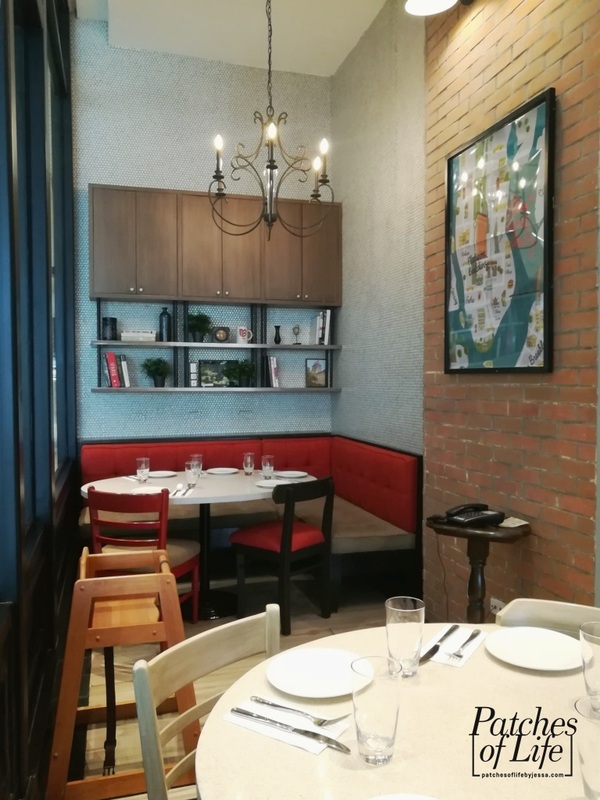 So they went back to the modern classy atmosphere, but they kept the solo options for some dishes, and even added small plates. Outside, in front of FlatIron 1771 and Sentro 1771, they've placed a bar suitable for after-work drinking sessions. 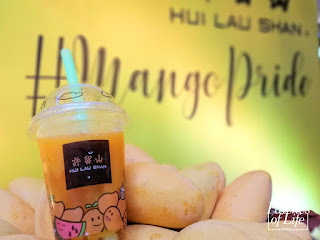 On this visit, I tried some of the new items and old time favorites! 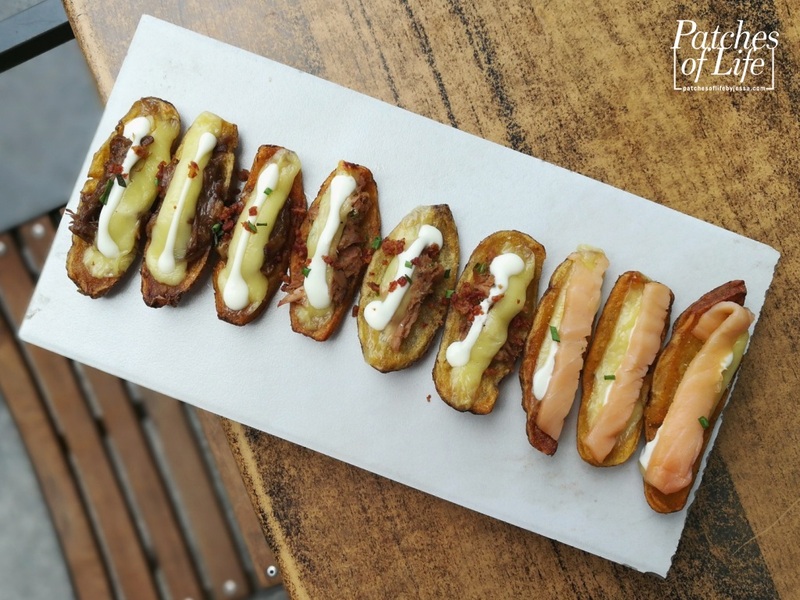 Potato Skins Platter consists of Bravo, Tuna, and Smoked Salmon Potato Skins - 3 of each flavor. 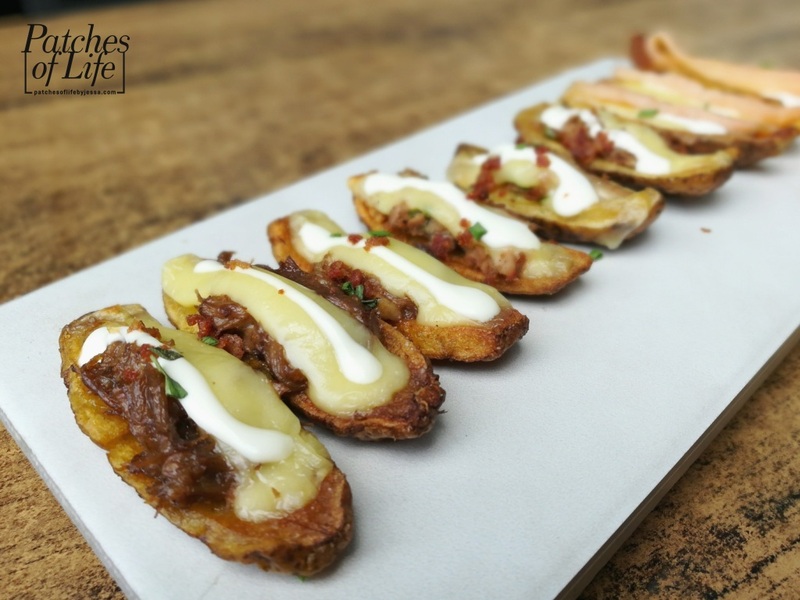 These are baked potato wedges with skin on, and topped with cheese, sour cream, and pulled beef brisket/tuna/salmon. I've tried the Bravo and Tuna before and I absolutely loved them! This time I had the Smoked Salmon and I think it's my favorite now. It's refreshing to palate and flavor rich. A different take on potatoes as appetizer. 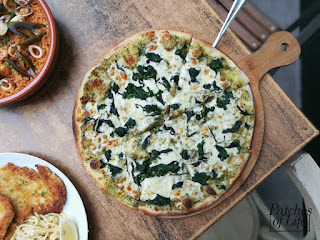 Admittedly, FlatIron's Four-Cheese Pizza is my favorite among their pizza offerings but Pesto Pizza comes close. 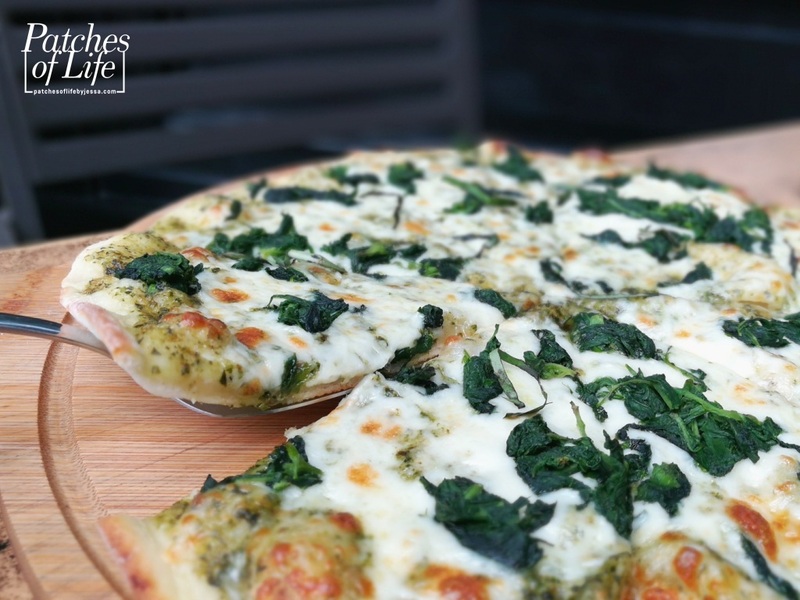 If you are like me who loves pesto and cheese, you'll find a harmonious combination of the two in this soft thin-crusted pizza. Hearty, healthy, this is what Chicken Keto Agliata reminds me of. Grilled chicken, simply flavored and smoky, with perfectly-cooked tender meat, comes with some greens and roasted cherry tomatoes. 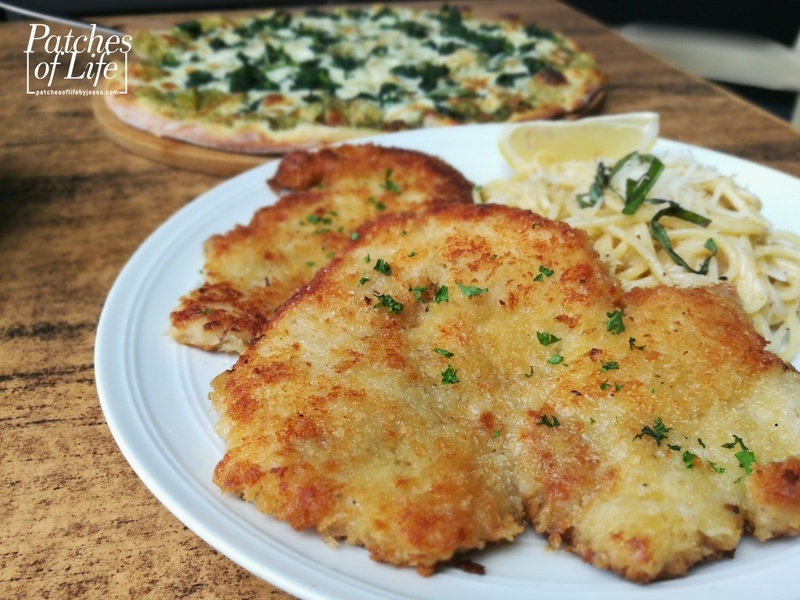 It's a non-guilt option that is truly enjoyable and tasty. Truffle Carbonara with Chicken Skin Crackling is carbonara with Filipino twist! 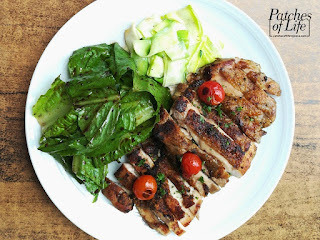 You should know how Pinoys love those crispy chicken skin as appetizer, snacks, or drinking pica. 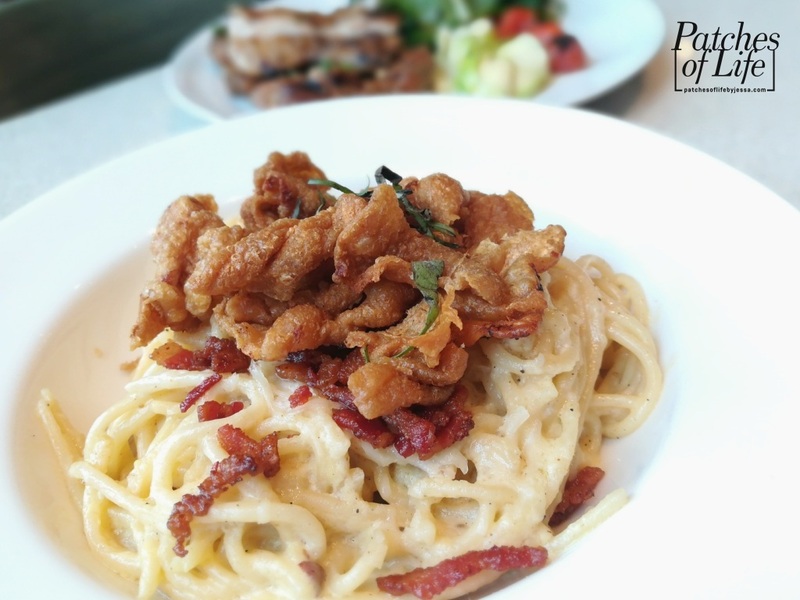 Its addition to this creamy distinctly good pasta gave a complementing texture of crunchiness that I really love! 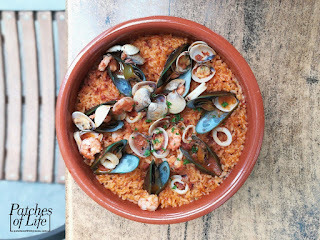 I cannot remember if I've ever tried Jambalaya before, but this dish is like a combination of risotto and seafood paella. 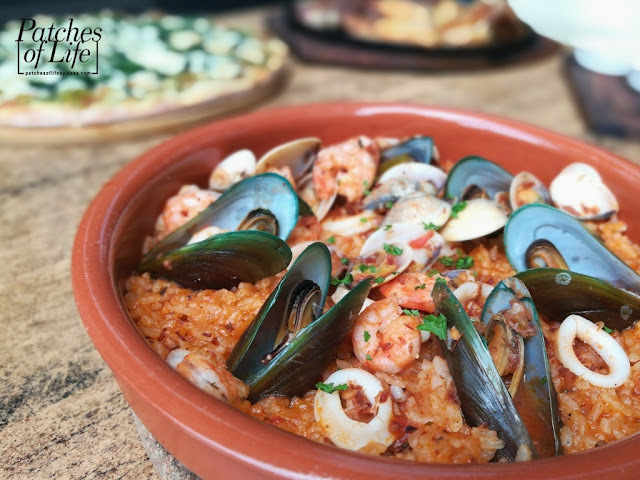 The rice is creamier and moist like risotto, but it is filled with seafood toppings like that in paella. 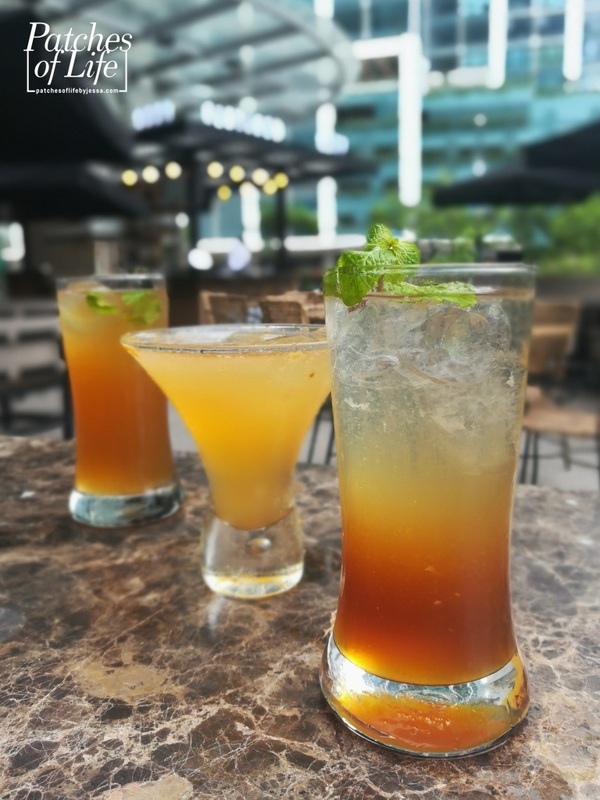 It has mild spice with very evident seafood taste. 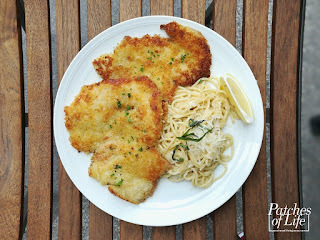 A FlatIron 1771 favorite -- Chicken Piccata! It looks so simple, thin, and lightly breaded, but there's so much about its simplicity to love! To achieve the perfect texture and "doneness", and mix of buttery and zesty goodness, what happens in the kitchen must not be that effortless. 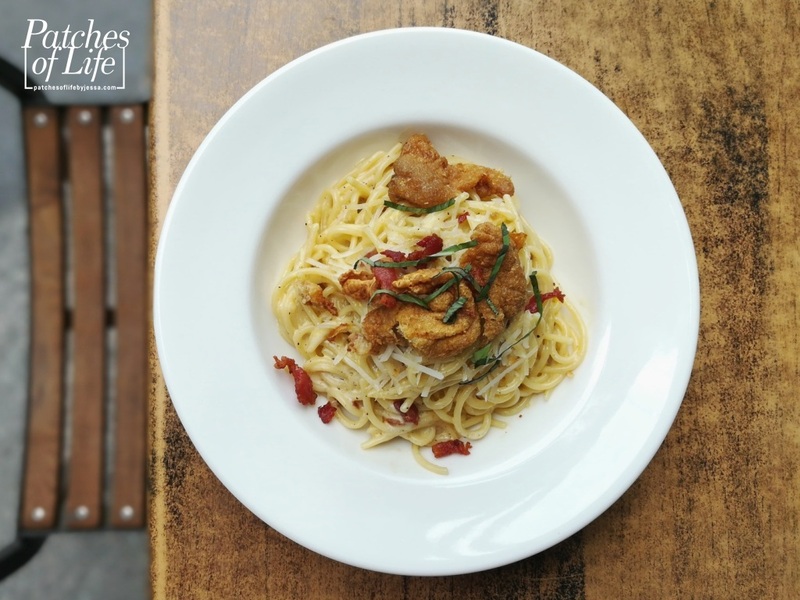 This dish is so easy to love and that's why it is a mainstay in the menu. 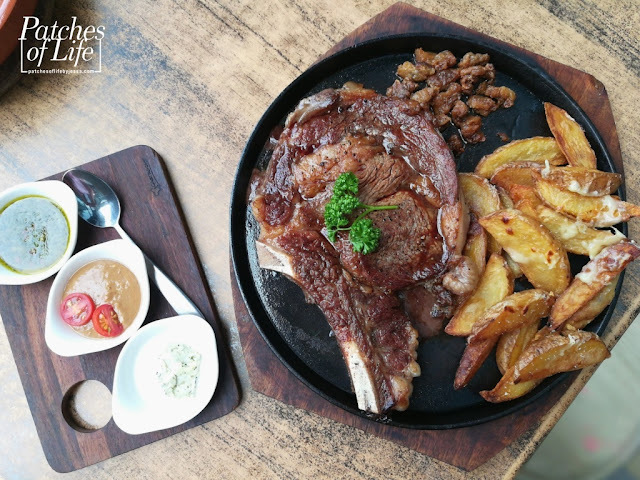 The star of our lunch was this Prime Rib Steak with Toasted Fat. 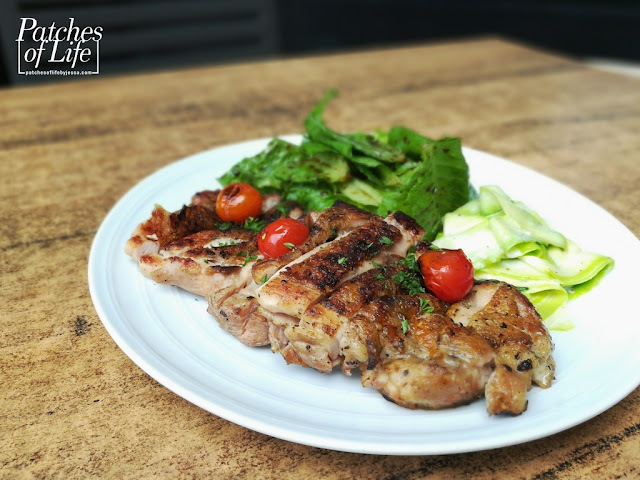 Thick cut, seasoned with salt and pepper, tender and flavorful on its own. It was served medium well to well done, though I prefer it medium or medium rare. It comes with 3 sauces: chimichurri which gives a minty herby refreshing touch on the meat, bois boudran that has a sour sesame-like hints and pungency, and bleu cheese. I prefer the first two sauces for this steak though even without, it's good. But what I love the most are the sinful and scrumptious toasted fats!! They're really good that I didn't mind eating fats, which I don't usually do. One of the desserts that we had is Coffee Pie. 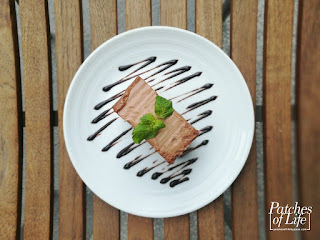 It was my first time to try this though it has been a 1771 signature dessert. 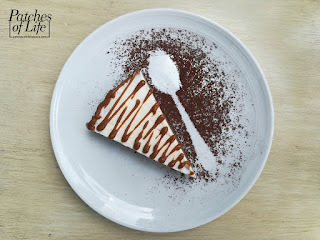 No wonder why as it is comfortably good with its bitter-sweet balance, toffee drizzle, and crunchy cashew crust that complements the soft filling. Peanut Butter Delice provides an alternative to the usual chocolate, cheese, or butter cake desserts. 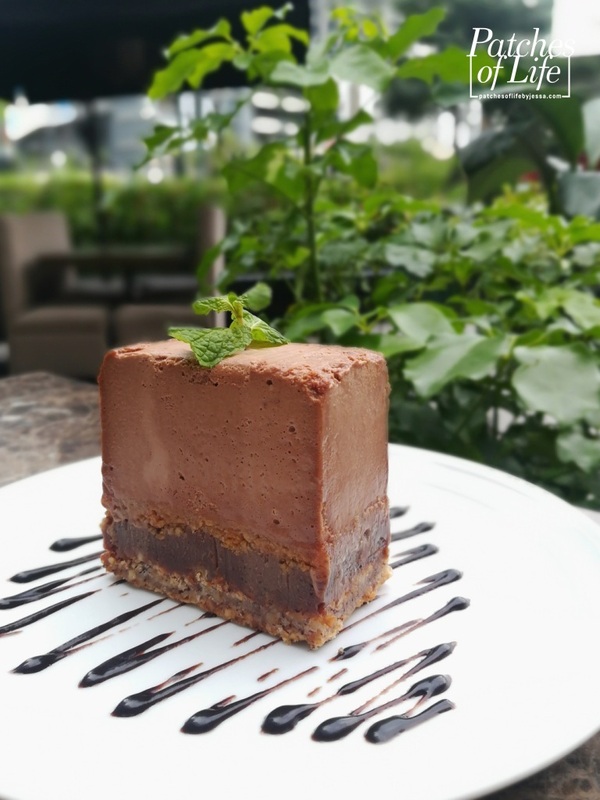 It looks like a block but it is actually soft and consists of different-textured layers of nuts. 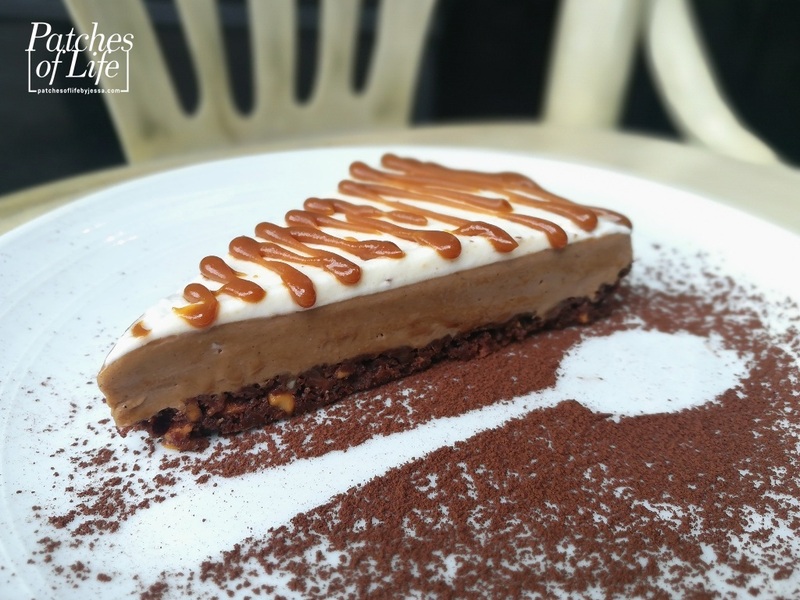 It's a chocolate-peanut butter combination but not comparable to Reese's Peanut Butter Cups that are much sweeter. Something new from FlatIron 1771 is the bar. They made use of the space in front of FlatIron and Sentro. 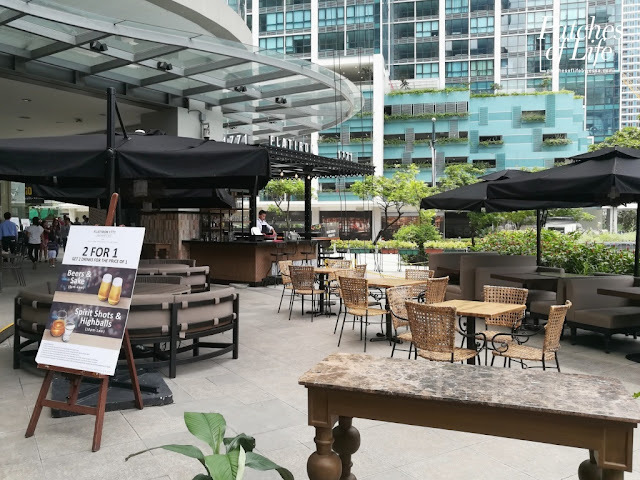 It's al fresco with comfy seating and a beautiful view of Uptown Mall's fountain especially at night. 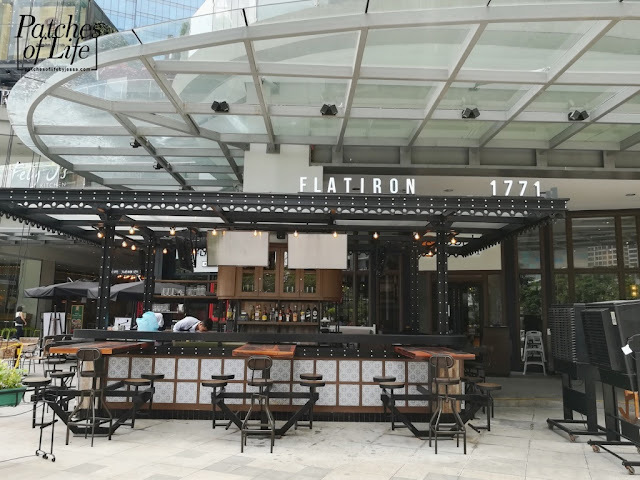 So whether you're craving for good food and pleasant ambiance, or you're up for some cocktails while hanging out with co-workers and friends, FlatIron 1771 Restaurant and Bar is the place you can go to here in Uptown Mall, Bonifacio Global City. 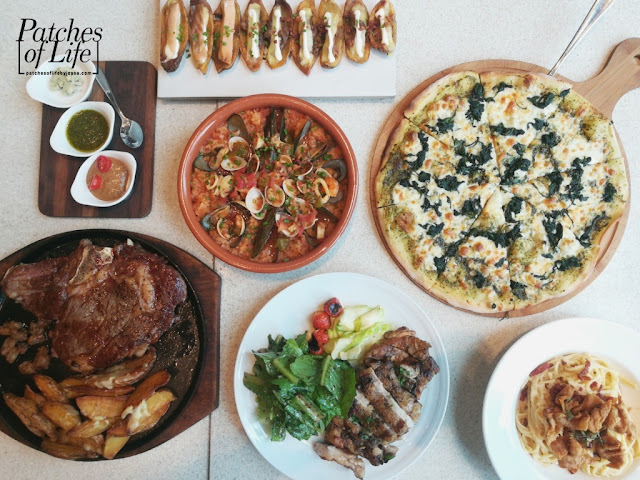 Disclaimer: I was invited as a blogger to feature this restaurant. I did not pay anything. Pictures with my watermark are mine. 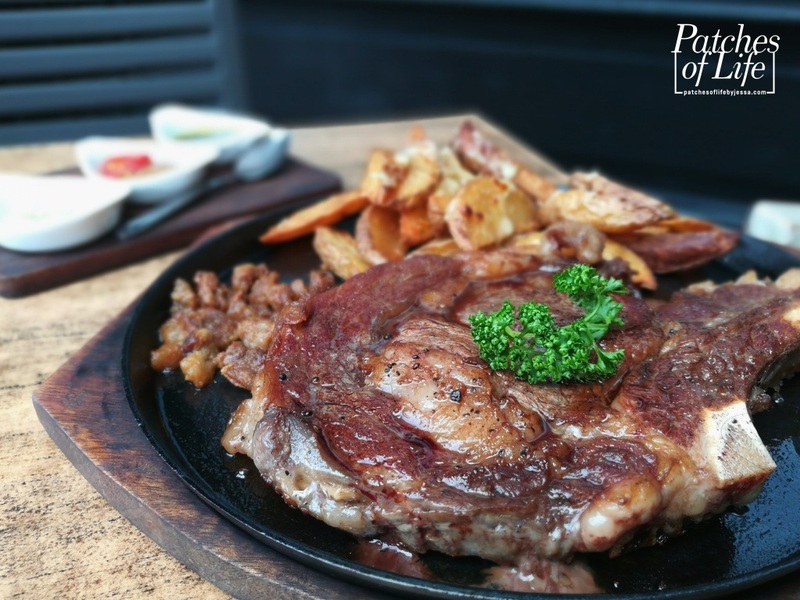 Soban K-Town Grill: Mega Meat BBQ Set!